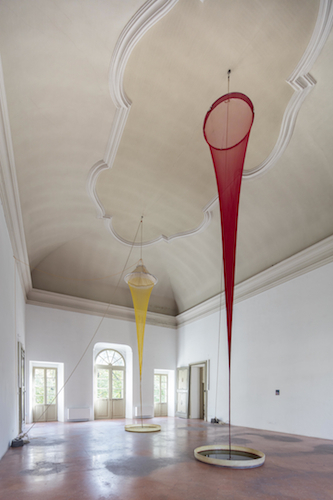 Christina Mackie, Filters, 2014, silk, linen, nylon, resin, aluminum, pulleys, glass, fiberglass, dye, hemp, sisal, ropes, each 26' x 24". Everything about this exhibition leads one to conclude that the building where the gallery is located is its true subject. It is a place simultaneously precious and fragile in its decorations and frescoes, and the curator, Gigiotto Del Vecchio, has skillfully created a reverberation between the artists’ gestures and the sumptuous rooms. Enchanting are Natalie Häusler’s slabs of acrylic-painted cardboard atop a floor piece and completed by a sound recording in Monika/Subway, 2012. Two works from Christina Mackie’s “Filter” series, 2014, are equally magical and fascinating—featuring cones made from silk gauze, each absorbing pigment from basins for the entire duration of the exhibition. Magic also reoccurs as a preposterous attitude in Charlie Billingham’s dexterous paintings, the most striking of which is Post Horn, 2015, a sort of screen executed in oil on linen. There are also hints of witchcraft in the work of Douglas Gordon, especially his two pieces titled “Self Portrait of You + Me,” 2012, made of burned paper, smoke, and mirrors. Giulio Delvè addresses the unearthly as the enchantment of the ordinary, recording the small but great miracles of everyday occurrences such as those encountered on the street. His surprising and apparently spontaneous pieces include Azione meccanica (di una roccia effusive su un solido amorfo) (Mechanical Action [of an effusive rock on an amorphous solid]), 2011, made of a small, porphyry cobblestone, perhaps one used for street paving, which in turn is covered in little cubes of glass resembling bits of a shattered shop window.